Darren Campbell has said that losing two medals because of Dwain Chambers' doping abuse was behind his move to boycott a lap of honour in Gothenburg. His 2002 relay gold and 2003 world silver were taken away because Chambers used performance-enhancing drugs. Campbell refused to celebrate GB's European Championships 4x100m win. "I felt that the fact that I have lost two medals because of what occurred with Dwain, it wasn't appropriate," he told a London radio station. "I made my feelings clear to the management and I don't really want to discuss it too much further." It is believed Campbell did not want Chambers in the team following his two-year ban for taking the steroid THG. But he has called on Chambers to expose the people who introduced him to performance-enhancing drugs. Campbell added: "I stood by Dwain with regard to not feeling that he was solely accountable. "I just felt that in return he should really expose the people that took him over there so we can protect another youngster from getting into that situation." The 32-year-old will make an announcement on his future after the World Junior Championships in Beijing this week, where he will be helping some of Britain's rising stars. 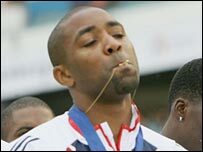 Meanwhile, former GB sprinter John Regis has criticised Campbell's actions in refusing to take part in the lap of honour. "I'm disappointed with Darren. He should have aired his concerns in private and not in public," Regis told BBC Radio Five Live. "If he felt so strongly against the situation with Dwain, then he had the choice of standing aside and letting someone else take his place. "Darren doesn't pick the team. The team officials made the decision but Darren had the chance not to run. "He has been a great ambassador for British athletics and he is one of the best athletes this country has seen but I think he has got it wrong and his actions have taken away the sheen of the team winning European gold." Regis added that Campbell's stance against Chambers was confusing as he is coached by Linford Christie, who served a two-year suspension for taking banned steroids in 1999. "For Darren to say that Dwain is one of the reasons why he isn't competing opens a new can of worms," he said. "You can't say no to Dwain when your own coach has failed a drugs test."